Archer Room - The room divides in half. One half, or the full room may be reserved. The Leonard and Marion Archer Community Meeting Rooms are located on the library's lower level, will accommodate up to 120 theater style and 80 conference style. This space can be subdivided into two smaller meeting rooms. There is no charge for the use of the rooms. Free WI-FI is accessible in the room. Please see our Meeting Room Policy for more details. Meeting attendees are encouraged to park in the 24 hour parking lot behind the library. The lot adjacent to the library is only 2 hour parking, and is enforced. 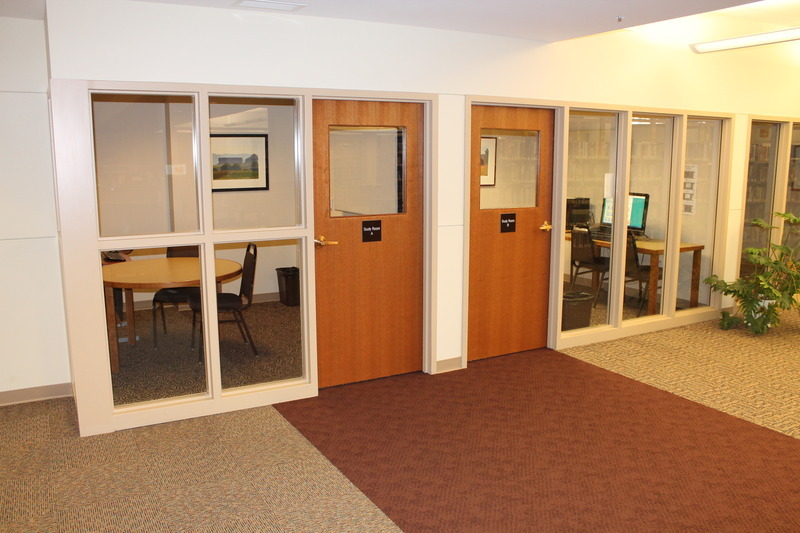 The library also has 4 small study rooms in the lower level, and are ideal for individuals or groups up to 4 people. These rooms are reserved at the Lower Level Reference desk; either scheduled in advanced or in a walk-in basis. Study rooms "A' and "B" have desktop computers, and can be booked for an hour. Study room "B" also has a scanner with the computer. Study rooms "C" and "D" can be booked for up to 3 hours.